Why you'll want the new Surface Book i7 - 16 hours of battery life people! Both the Surface Book and the Surface Pro 4 have been well received by users, but nothing stands still in the technology world. 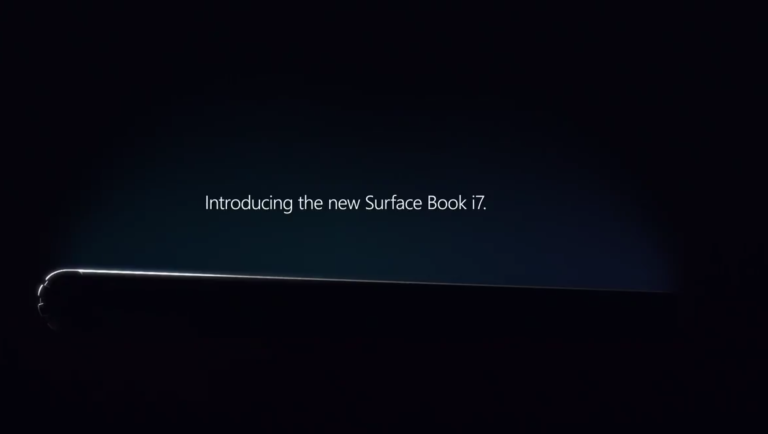 So we have a new Surface Book, called Surface Book i7. It boasts twice the graphics performance of last year's model plus more battery capacity, meaning you'll get a whopping 16 hours of battery life with the new model (30 percent more). This, in Microsoft's words, is "the top" - the best of the best. You can bet Intel is pretty pleased with the new name. The screen and general design are the same, but that's no bad thing since last year's model was so well received, not least by us. The success of both these laptop-tablet hybrids means successors are more or less inevitable, but there's been nothing official out of Redmond yet. Here are all the unofficial rumours, the whispered gossip and the insider hints we've been able to pick up so far. Microsoft's first Surface Book - indeed its first self-made laptop full stop - was unveiled in October 2015, almost out of the blue. Of course the Surface Pros were already established by then, but this was a different kind of device, a sort of reference design for Windows laptops, with a strange-looking hinge and a screen that was completely detachable. While it hasn't been a completely smooth ride since then, and the high price put some people off, there's still a lot of anticipation around for what Microsoft might have planned next - if it can build on the best bits of the Surface Book and iron out some of the problems at the same time, then the Surface Book 2 should be a formidable, high-end laptop. Microsoft hasn't yet said a Surface Book 2 is definitely happening, but it must be on the cards. Both the Windows 10 update schedule and the arrival of Intel's next-generation Kaby Lake processors suggest that spring 2017 is the time to look out for, when we should see a pile of new Surface-branded kit (including the long-rumoured Surface Phone). So what are we actually getting with the Surface Book 2? The speculation so far points to more of the same, with a similar design and improved internals (including the Kaby Lake CPUs we've already mentioned), and hopefully none of the original teething problems. Key features like the Dynamic Fulcrum Hinge should be improved second time around. We're not expecting the price to drop much - in fact it might go up - and of course Windows 10 will be on board. There have also been murmurings that the already high resolution 3000 x 2000 pixel Surface Book screen will get an upgrade too, to 3840 x 2160 pixels (4K), so this is going to be a perfect device for graphics work or binge-watching Netflix shows. Hopefully the introduction of the Kaby Lake processors should mean better battery performance as well, so you can eke out more time with the laptop on the go, and there has been talk of the new Surface Book 2 coming with a rechargeable stylus rather than a battery-powered one. Microsoft will want to take its time to get the new laptop right. On to the Surface Pro 5, and this is a line of hardware that doesn't need much in the way of an introduction - the Surface Pro series has been a hit for Microsoft, backed up by its decision to develop Windows 10 (and indeed Windows 8) as an OS that is at home in desktop or tablet modes.The Surface Pro 5 will aim to carry on and build on that success. The range has certainly come a long way since 2013 when it first appeared. Back then, the hardware wasn't really up to scratch, and nor was Windows 8; since then, both the specs and the software have been improved, and of course the world at large has warmed to the idea of lightweight tablets that double up as laptops if you stick a keyboard on them. The most recent of these devices, the rather impressive Surface Pro 4, launched in October 2015 alongside the Surface Book, so Microsoft won't be in any hurry to replace it with a newer model. However, the tech scene doesn't stay still for long, and we're expecting the line-up to be refreshed at some point during 2017, if not before the end of the year. As with the Surface Book 2, the Surface Pro 5 is thought to be arriving in the first half of next year, to coincide with both a major Windows 10 update and the emergence of the new Kaby Lake processors from Intel. Surface Pro launches haven't exactly stuck to a fixed schedule in the past, so Microsoft isn't tied to a release date (unlike Apple and the iPhone). The rumours point to a similar starting price point of around $900 in the US and £750 in the UK, while as we mentioned above it seems that a rechargeable stylus is on the cards. Battery life should be better as well, which will come as a relief to a lot of existing users - a so-so battery life level is one of the few major complaints to be levelled against the Pro 4. Aside from the Kaby Lake CPUs, we haven't heard much in the way of specs for the Surface Pro 5. Microsoft won't want to mess with its winning formula too much, but you can bet that the internal specs will get a small boost. A 4K screen might be on the cards, and it would make sense if Microsoft upgraded the series to support the USB-C standard too.